Palm Springs is a desert environment, located in Riverside County, California. This city has plenty to offer during your stay, including tons of magnificent parks, a handful of cool museums, great places to eat, and gorgeous golf courses. Palm Springs also has comfortable places to stay, no matter how long you plan to visit. To help you get around the city, it is advisable to book a car rental in Palm Springs at VroomVroomVroom. Not only will you enjoy the freedom of exploring the area at your own pace, you will also get to save up on rental cars! A cheap car rental will provide the convenience of easy travel and fun exploration while visiting. This visually gorgeous desert environment has several astonishing mountains, bike trails, and even road trails to enhance the visual experience. Enjoy some tranquility and take a hike on the gorgeous San Jacinto Mountain and astonish your eyes with the amazing views while hiking. Agua Caliente Indian Canyons also provides some visual appeal with its well-known Paul Canyon Trail. After you rent a car, you can stop by the Palm Springs visitor Center for great information on what the city has to offer. Save time and money - No need to go through different car rental websites to compare prices because you can now do that at VroomVroomVroom. By sorting the list by price, you can find the cheapest rental car right away. We also offer the lowest rates. Check out our Price Promise for more details. No hidden fees - We don't charge any booking fees so you only get to pay the rental car rate. We are the experts in booking a car rental, and we provide you with the car rental you need for your trip to Palm Springs or anywhere else in California. High quality vehicles - We make sure that you will get a reliable yet affordable car that's why we have partnered with the country's leading rental car companies including Avis, Budget and Enterprise. Excellent customer assistance - Should you need help in booking your car rental in Palm Springs or have any questions, make sure to contact us and our customer care experts will be happy to assist you. Palm Springs, in California, is a total, year round escape destination. Palm Springs offers something for everyone, whether it be enjoying 350 days of sunshine a year, shopping, golfing, hiking, adventure, Jeep tours, gaming, mid- century modern architecture, cultural events, museums, and nightlife or just sitting back and relaxing by the pool shadowed by those magnificent mountains. This wonderful desert land is much more than meets the eye! The entertainment is non-stop for any visitor to Palm Springs, California. Hop in your rental car and visit the 1200-acre Living Desert in Palm Springs. Take a stroll, a hike, or have a picnic there and you'll be able to watch wild animals such as zebras, giraffes, bobcats, wolves and much more in their natural setting! Drive your rental vehicle over to VillageFest in downtown Palm Springs and enjoy a good old fashioned street fair. Watch street performers and musicians present awesome shows, and take the opportunity to shop at a great street market while you're there. Take a short drive to the Moorten Botanical Garden for a nice visual experience or visit the Smoke Tree Stables for a romantic evening horseback riding. If you're in the mood for shopping, visit Desert Hills Premium Outlets or perhaps head on down to Johnny Costa's Ristorante for some great Italian dinners. You are sure never to miss a good time with your Palm Springs car rental. You can easily attend a live, broadway, comedic party filled with music and dance performed by youngters aged 56-86! If you're looking for adventure while staying, drive over to Desert Adventures and enjoy a ride on their private 840-acre Metate Ranch. It's completely up to you, when you have the freedom that your affordable car rental will provide for you and your family! 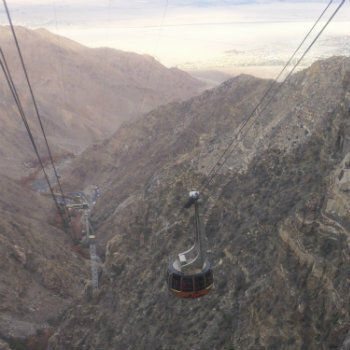 Get aboard the world's largest rotating tram car, and experience a breathtaking journey up the sheer cliffs of Chino Canyon,rise to the Mountain Station at 8,516 ft. In winter, you can cross- country ski and snowshoe. In summer, camping and guided tours are available. Indulge in the spectacular views of the desert below from Peaks Restaurant or Pines Cafeteria style restaurant where lunch and dinner are served daily. See the hilarious, fabulous Palm Springs Follies perform at the Plaza Theater. Internationally known guest stars, hilarious variety acts and their legendary line of long legged lovelies, all over the age of 55, have made the Follies a Palm Springs favorite. The oldest member of the Follies is currently 86 years old. Located on Aqua Caliente tribal land, the canyons are a must see. Undisturbed natural beauty is combined with remarkably easy access, the canyons are located just minutes from downtown Palm Springs. Palm Canyon Drive becomes an old fashioned street fair, musicians, food, arts and crafts vendors, and a Farmers Market every Thursday night from 6pm to 10pm (October until May) and 7pm to 10pm (June until September) except holidays. It is located between Amado and Baristo Roads. This is a 'family based' water playground of deluxe category with 18 major water slides and attractions including the 800,000 gallon Rip Tide Reef wave pool. It opens daily from mid March through to Labor Day, and weekends through October. Bearfoot Inn is a clothing optional hotel resort for gay men in Palm Springs, California. It is your oasis in the desert and home away from home located in sunny Palm Springs, California. Casual and elegant, yet masculine, and faithfully restored to reflect its Mid-Century Modern architecture, Bearfoot Inn has been upgraded with modern amenities so you can relax and be yourself. We are the only clothing optional resort for gay men in the historic Movie Colony neighborhood, adjacent to the Palm Springs Uptown Design District and located within walking distance to great restaurants and shopping. Palm Springs' gay epicenter, Arenas Road is also within walking distance or a short cab ride away. Experience how's it like living the island life of Polynesia at Caliente Tropics. The Tiki-style tropical resort has welcomed famous celebrities in the past including Elvis Presley, Sammy Davis Jr., Dean Martin. In fact, the Cellar Lounge was said to be one of the favortie hangouts of Frank Sinatra's Rat Pack in Palm Springs. The resort boats of their gigantic swimming pool and outdoor spa pool. Caliente Tropics is also pet-friendly so guests can bring their furry friend on vacation.